When Newport, Rhode Island was founded in 1639, what were people wearing? 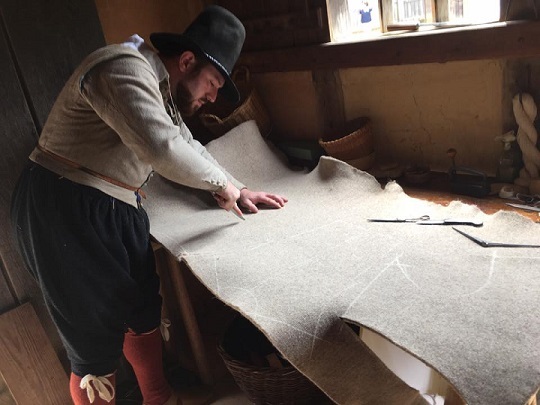 Join the Newport Historical Society’s History Space event, A Colonist’s Wardrobe, on Saturday April 20, 2019, from 10am-2pm, at the Wanton-Lyman-Hazard House, 17 Broadway, Newport, RI, for an interactive program with 17th century tailor Dan Rosen. Chat with Dan and feel the fabrics as he demonstrates the work of a colonial clothier to answer this question. For over ten years, Dan Rosen has been fascinated by the clothes new settlers in North America selected to protect them in their new, unfamiliar environment. He has reconstructed the recommended wardrobe for a hypothetical colonist based on the suggestions and experiences of earlier mariners and merchants, visitors and voyagers. His interpretations of the garments and objects which may have armored early Rhode Islanders against the bitter winter and scorching summer are hand sewn exclusively using the techniques, tools, and materials that tailors employed 400 years ago. Originally trained as an artist and educator, Rosen served an internship with the Tudor Tailor in the United Kingdom in 2013. That same year, he established Old England Grown New, a project dedicated to understanding and sharing how clothes were made and used in the Early Modern Era with as few compromises as possible. With a deep focus on the garments and objects employed by working people and colonists in North America, Dan has presented hands-on demonstrations and displays to the public for half his life. This free program is rescheduled from October 2018 when it was canceled due to inclement weather. The event takes place on Saturday, April 20, 2019 from 10am-2pm at the c.1699 Wanton-Lyman-Hazard House, located at 17 Broadway, and the building will be open to visitors. Donations welcome.